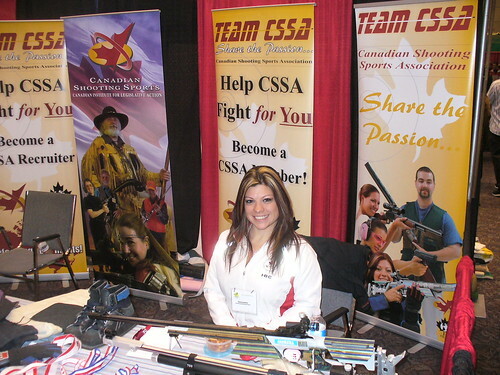 Well, I’m going to head down to the Toronto Sportsmen’s Show tonight and for Thursday through Saturday, I’ll be helping man the CSSA booth and promoting said organization. I’ll be editing this post as the days progress and uploading an image or three from the show. OH! Don’t forget to grab the $2 off coupon available from the CSSA HERE. Yeah it’s only $2 off the $19 admission fee, but $17 is better than $19. So on day one of my participation, I had brought down a couple rifles to display at one of the two CSSA booths. Displayed both of my late uncle’s hunting rifles, a Savage 99E (.308 Win), and a 1960’s era Weatherby Vanguard (.300WM). The latter is all original and immaculate. It drew in many of the hunters who admired those beautiful lines of the Weatherby and the classic lever goodness of the Savage. Once again showed up for volunteering with the CSSA. I really seem to enjoy talking to people about the CSSA. While I doubt I could ever be a media face/debater for the CSSA like Tony B. or John E, it is always fun for me to engage in face to face discussions. In addition to the above mentioned rifles, today brought out the M-1 Garand with a couple en-bloc clips and a bayonet. Amazing to see so many younger people stop and admire the Garand. Call of Duty and/or Medal of Honor video gamers who got to see the real thing. Considering I bought the Garand specifically because I wanted to see if the “P-TING” of an ejecting en-bloc was true from my playing of CoD, I cannot fault these gamers at all. Busy day and once again, another 10AM to 8 PM shift, made for another long, yet rewarding day. Since the CSSA provided IPSC with a spot right next to one of the CSSA booth in the hunting hall, I was able to have a great conversation with Pat Harrison for nearly 45minutes. What a great person to talk to about training, action shooting and camaraderie of the shooting community. I think he thoroughly enjoyed himself in promoting IPSC in such a venue. Had one individual come back around near 8PM and us (CSSA) packing up, just so they could hold an actual Garand. Always happy to oblige. 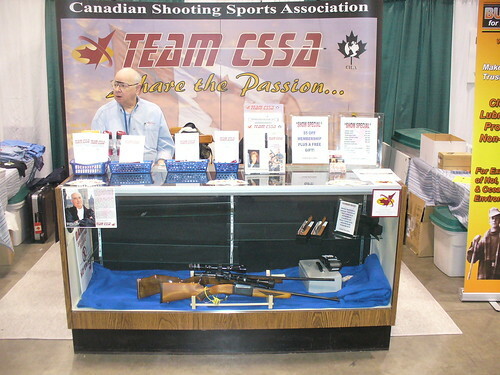 CSSA booth in the "Hunting Hall"
Never did get around to getting a flash card reader… Today was my last volunteer day for the CSSA, once again brought out the three rifles, and the Garand once again was the most popular. Worked the booths from 10PM to 3PM and finally had a couple hours to wander the show and ended up buying a nice hoodie and a flag for “Support Our Troops”. By the end of the third day, my feet were done, voice was to a point that I couldn’t yell, and I was thoroughly sick of dragging my gun case with rifles back and forth… Glad my part is over and even looking forwards to the next one. Some people may say the show is not as good as it once was, and my response would be that change forced a reboot of sorts. I do miss the old facilities (Parking is 5x better and the single floor layout is so much nicer to navigate), but I’m happy because otherwise there would not be a Hunting Hall due to former Mayor Miller’s ideological idiocy. This entry was posted on March 16, 2011 by M. Duynhoven. It was filed under CSSA, Ranting & Raving .